That is such a great enhancement. I can barely wait for 3.5. Thank you! 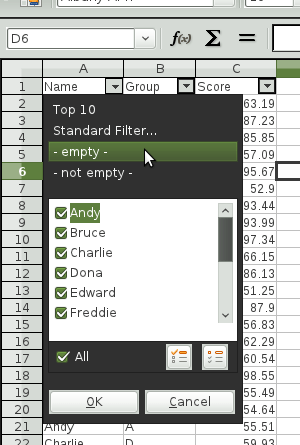 The competitive product (say not the name) has an additional functionality in the same popdown window: sorting. In LibreOffice people tend to first filter and then sort the filter result, witch from my POW gives a wrong result. Only sorting first and then filtering gives the desired result. Do you have any plans for implementing a build in sorting in the AutoFilter? By the way: Great work you do every day. Kohai – you make a big different. Sorting? Sure. That would be a possibility if that improves Calc’s usability in general. For now, I have no concrete plans as to what to add to the menu; so, anything is possible. I’ll keep the sorting functionality in the back of my head. Thanks for your feedback. please please add also this sorting-Item. I miss it too in LO. I too desire / require sorting in the filter menu. Also after the filter menu is closed, please auto-scroll the current sheet up to the top so that users don’t think there are no results with the current filter and really, they just need to scroll up for them. Hi, Kohei san. That’s one of very rare situations that i want say THANK YOU MAN and bless You God! Uso muito o Auto Filtro e estava sentido falta desse recurso no LibreOffice. Eu e muitos outros que fazem uso dessa suíte, estamos torcendo pelo seu sucesso. P.S. : Será que ainda dá pra incorporar a pesquisa através de digitação de palavras como ocorrer com o MSO? Just joined the user group, moved to LIBRE yesterday! the another thing cool can be upgrade the pivot tables system…. I think the new redesign of the autofilter stays this way I can’t use Libre Office Calc anymore.. Not in a way I will like it.. Most of the times I use it for learning spanish.. I’ve got more than 10.000 words (with the translation) and I keep adding new words whenever I find a new word in the book I’m reading.. The current autofilter option is perfect for this to see if a word is already on the list or not.. By typing a word in the auto filter popup I can check if it’s already on the list or not..
You can use selection list for that purpose. Just move the cursor to the bottom row and hit Alt-(down arrow), then you’ll get the popup much like the old autofilter popup. Ok.. That’s a little workaround for me.. Thanks. But when I find a word that’s on my list I also would like to see the translation.. A lot of times I write down words for which I’m not sure what the meaning is.. So the word can be on my list but I forgot what the meaning was or I’m not sure.. So for my (maybe not very effective) way of learning another language the redesigned autofilter will not be as workable anymore.. For me it would be nice if there will be two separate autofilters.. One basic like the old one and a new more enhanced like the new one.. Thanks for your answer..
For your use case, perhaps VLOOKUP (it’s a built-in cell function) is the right tool to use. The new popup autofilter have a very nice design, and work very well. And the 3.5 version of LibreOffice, seems to be a very good version, first of all, by the great reduction on the bugs and the performance improvement. But, (always a but), the popup seems to have been loosed the ability to use the letters/numbers in the keyboard to arrive at one item. This was very useful in long list selection. The sort by Font and Background color is a great idea!! I support that sorting method 100%. Great idea! The location of the drop down window, as currently designed, along the left border of the column, is not a good design. 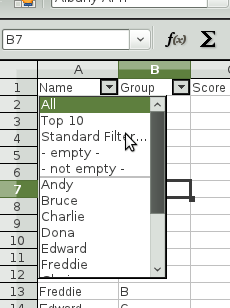 This is because it now hides the values in the current column, which may be useful to see when selecting a value in the drop down list. I’ve been using 3.5 for a while and find that I do indeed often like to see the values currently displayed there (and now hidden by the drop down). I better design choice would be to align the left border of the dropdown window with the dropdown button (further right) and leave cell values visible. Cool! I just started using the AutoFilter and missed right that option. Thanks! Nice update on the autofilter. We’re using LibreOffice 3.5 at work and are apart from some performance problems pretty happy with it. Unfortunately we found a quite annoying problem with the new autofilter. The Cells in the column which is filtered have some very long content, which looks always the same at the beginning and differs only at the end. Unfortunately the window for the Autofilter is too small in breadth so that when trying to filter you can’t see the whole lenght of the content, which makes it very hard to find the content you want to filter for. Any advice on how to solve that problem? The FOSS community thanks you for your commitment and input! I really appreciate you work and effort to improve over age old autofilter. I have one small issue with current implementation in v3.5. Old implementation of autofilter we can jump to the intended word in list by typing the initial few letters. That was very handy and didn’t require use of mouse. now i have to use mouse to scroll till i reach the intended filter item. Could you please add that functionality? or may be the option between old-filter v/s advance filter? Thanks. The options you gave me for a workaround don’t really work for me.. Please take yogesh’s questions into consideration.. Thanks. This is NOT anything that is helpful to me. I use auto-filter all day long, what used to take me less then a second now takes me seconds. Is there anyway to revert? If not, this makes LibreOffice about useless to me. Use case: I only want to see red from a list of 10 colors. Old way: click type r, select, I see what I need. New way: click, unselect all, scroll through list, select, click ok.
I’m not sure how this is “better” it’s a total waste of my time, and personally not what the auto-filter is for. What you created was another full filter that was always there.